Pentatonix is embarking on a 2019 world tour, and bringing it to the glitz and glamour of Las Vegas! The Grammy winners and "The Sing-Off" season 3 champions will perform at Mandalay Bay Events Center on Saturday, July 6; fans can get tickets starting next Friday, Feb. 15 here at AXS. The vocal group announced their 2019 tour plans on Twitter, with Rachel Platten as their special guest; it will be their second world tour, after a successful run of more than 100 shows in 2016. This year's tour will include 45 shows within the United States and Canada, but Pentatonix has not confirmed any details about the international part of the tour yet. Their concert plans come after they released two albums last year. PTX Presents: Top Pop, Vol. 1 was released in April, followed by the holiday album Christmas Is Here! in October. The former peaked at number 10 on the Billboard 200 albums chart, while the latter climbed to seventh on the Billboard 200 and also reached number one on the Billboard Top Holiday Albums Chart. 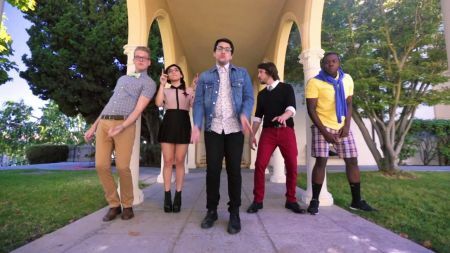 Pentatonix has exploded since they won the third season of "The Sing-Off" in 2011, even though they only met the day before auditions for the NBC singing competition began. In the last eight years, while original member Avi Kaplan left the group to spend more time with his family, they've won three Grammy Awards and released seven records. But their roots are in live performance; they're best when they're in front of an audience, whether it's a national TV crowd or a packed concert hall. All the energy fans have seen on TV is what they will experience seeing them live. Las Vegas is a particularly great place to see them, too, as the Mandalay Bay Events Center is an excellent venue that's played host to some of the biggest names in music. It's right on the Las Vegas Strip, and Pentatonix should fit right into the glitz and high energy of Vegas, with how much personality and flash they put into their performances (check out their "Can't Hold Me" video by playing the video above). This will be one of the best shows of the summer, and AXS has the tickets. Tickets to see Pentatonix live at Mandalay Bay Events Center go on sale Feb. 15 at 10 a.m. local time through the AXS event page. Ticket prices and more information are available on the event page. Full information on their 2019 world tour is available at their website. For more on Pentatonix, including tickets to their upcoming concerts, visit their artist page at AXS.